Justice League: No Justice #3 Review - Good! 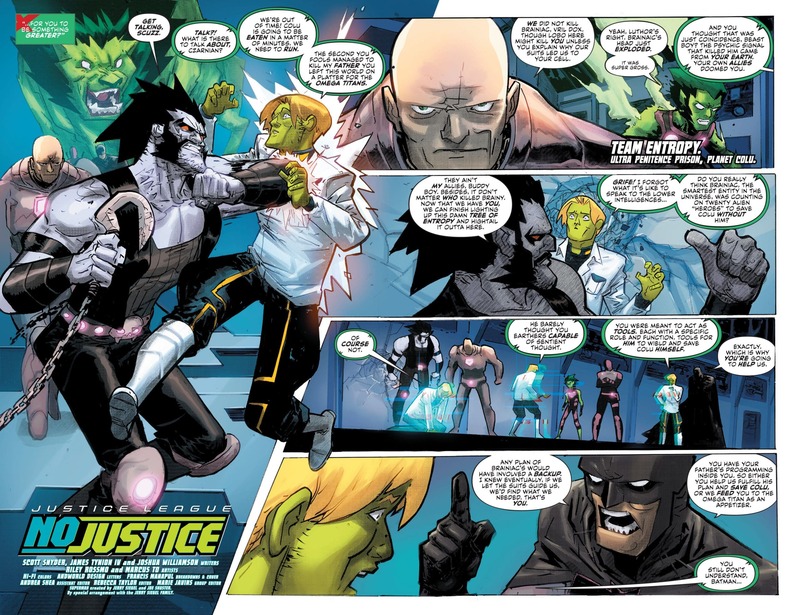 Justice League: No Justice #3 Review – Good! Verdict: 4 / 5Not as fun as the last two, but full of the same kinetic energy and intrigue. Justice League: No Justice #3 adds another unique element to this 4 part narrative. The fun of Justice League: No Justice thus far has continuously been through character interactions that we are not used too, especially featuring individuals that would normally be far less focused upon than in the past. 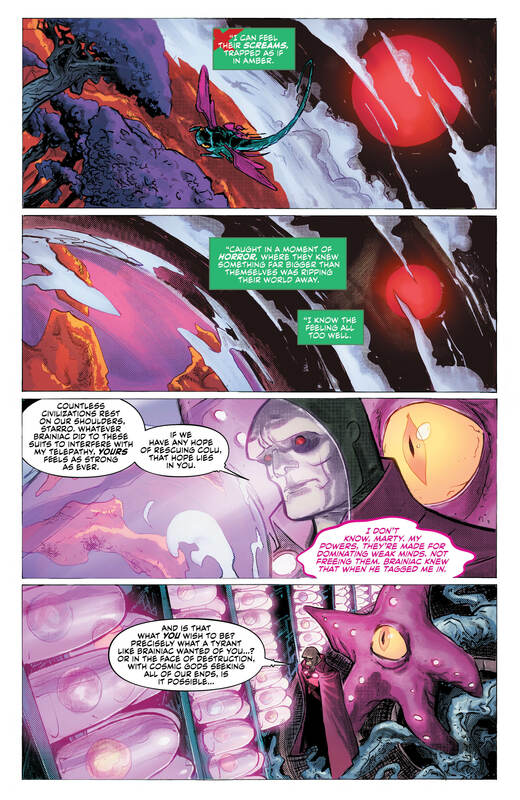 This issue does away with those interactions, instead directing our attention to the increased tension and higher stakes surrounding the fate of Brainiac’s homeworld, Colu. Not only this, but the lesser explored characters were placed on the back foot, in favour of well known Justice Leaguers, like Wonder Woman and Cyborg. Whilst this may take a little from the point of No Justice, especially since we are now less involved with the villain-hero dynamic we’ve been experiencing, it does not damage the overall event experience. What may be becoming more convoluted as we continue to move towards the conclusion of this story, is how these trees work exactly. I find the explanation confusing at best, especially with the inclusion of the suits that seem to inhibit the abilities each team needs to use. The introduction of Brainiac 2.0 has mainly served as a way in which the writers can once again swing Brainiac as a villain, taking from the original heroic turn that we had first encountered. This is to be expected and was told to us in a surprising way, but I feel there are more twists yet to come. The stand out of this series so far to me, as can be seen in this issue again, is Starro, the conqueror of worlds. Bizzare, quirky, sarcastic, powerful and ultimately heroic, the role Starro has to play here is well suited to the intergalactic starfish. Back on Earth, Amanda Waller and Green Arrow continue to argue over the best course of action for Earth’s safety, with neither necessarily winning the verbal confrontation but Queen inevitably winning the physical altercation that follows. The grand plan to send notice to Hal Jordon and the Green Lantern Core is one that is perhaps misguided and could ultimately not be enough to save the planet. The repercussions of this event have been promised throughout, with a death (although an insignificant one) so far and more damage to come. Ultimately, Justice League: No Justice is continuing to live up to the high stakes and works well when considered as part of the larger miniseries. The art quality is of a high standard and stylised like the rest of the series. This does really feel like the penultimate issue, leading to something much bigger. The most intriguing part of all of this still is the introduction into the universe of so many planets and the fallout of releasing them all. Whether this is what the main outcome of all of this remains to be seen, although I imagine it will play a large part of it. I am very excited to see where we conclude this saga and hope that the stakes promised are accurate.